We believe living a life by design is better than living a life by default. My staff and I take our customer service model very seriously. Together, we are committed to providing an exceptional client experience. If you need to schedule an appointment or request any other service, please let us know. Tory joined Team Dettmann in April 2018 as an Associate Financial Advisor. His primary role is to take a client’s financial plan from a vision to implementation. His analysis and consulting is key in the construction of our clients’ financial roadmap. Your interaction with Tory will be in the implementation of your plan design as well during review of your ongoing plan. Tory is from Eagan, Minnesota. He graduated with a bachelor’s degree from Bemidji State University and earned a Master of Business Administration from Bethel University. He lives in Woodbury with his wife, Lynette, and three daughters, Sophia, Ariana and Evelyn. The best financial advice I ever received: Stay out of debt, live on less than you make, invest the difference. The best part about my job is the people and the relationships. I get the opportunity to meet and collaborate with people on something that has such a significant, long term impact on their lives. When we can help someone align their financial behaviors with their values it is extremely rewarding. Jenny is responsible for marketing, scheduling and client services for Team Dettmann. She has been in the finance industry since 2011, joining Dave’s practice in 2016. Jenny and her husband, Jon, live in Apple Valley. They welcomed their son Adam in November 2017 and have enjoyed watching him develop into such a sweet little boy. They enjoy time with the family dog, Maggie, and spend summers golfing, boating and hanging out at the family cabin. During the winter months, they enjoy going skiing up north or in Colorado and rooting for the Minnesota Wild. My favorite part of my job is that I have a hand in connecting great people with a top advisor who can lead them in achieving both their financial and personal goals. The best financial advice I ever received is to be organized in both your spending and saving, and to regularly review where your money is going and what it’s doing for your long-term goals. Kelly has more than 25 years of experience working for agencies and financial representatives with Northwestern Mutual. She is currently working toward earning her CLU designation to further Team Dettmann’s commitment and expertise to provide guidance and knowledge of various insurance solutions to our clients. Kelly oversees getting our clients from the point of commitment to a solution being implemented. Her skill for how insurance companies work makes her an asset to our clients, not only in the implementation of insurance solutions, but also the ongoing maintenance of those solutions. Kelly has been married for more than 20 years to Dan with two wonderful kids, Maddie and Jake. Her daughter is currently in her sophomore year at University of Wisconsin Eau Claire pursuing a degree in Graphic Design. Her son is graduating from high school in 2019 and was just accepted to attend the U of M – Carlson School of Management. She enjoys volunteering within the local community, traveling, gardening and cooking in her spare time as well as spending as much quality time with her family as she can. She looks forward to experiencing new hobbies with her husband as they will soon be empty nesters. They recently adopted a dog named Finley and would like to explore being a foster family for dogs waiting to be placed in their forever home. The best financial advice I ever received is to budget your money and find a financial planner you trust and will be with you long term. The best part about my job is being part of such a dedicated and committed team. The amount of thought, time and effort that goes into planning for every client makes me proud to be part of something that makes a difference in our clients’ lives. Rachel received a B.A. in pre-law from the University of Wisconsin - LaCrosse in 2007. She earned her J.D. with honors in 2012 from William Mitchell College of Law, where she focused on tax law and estate planning. She was active in the Estate Planning Clinic on campus and also held an externship with the Chief Counsel for the IRS in St. Paul, MN. Rachel is passionate about helping others to plan for their future as well as meet any present needs in the most efficient and effective way possible. Rachel loves to travel, read, and spend time with her family outdoors. One of her most exciting adventures was when she and Dave lived in China for a year after getting married, teaching English at Nanchang Hangkong University and traveling as much as possible. But the greatest adventure of her life thus far was having children, starting with Adalie in 2010 while Rachel was in law school. Eliza was born three years later in 2013 and Rachel is currently attempting to convince Dave that now is the perfect time to add a dog to their family (the dog has joined the family, he is a Wheaton Terrier and his name is Buddy). Gregg has more than 20 years of financial planning and investment management experience and has been with Northwestern Mutual since June of 2017. As Director of Financial Planning Services, Gregg oversees a team of talented people who provide investment and financial planning support for advisor teams in the Network Office. Gregg has been a Certified Financial Planner (CFP®) since 2001 and graduated with an MBA in Finance and New Venture from the University of St. Thomas in 2007. He is married with two children and enjoys spending time with them, coaching basketball, and playing golf. The best financial advice I ever received was that Money is more important than Things, but less important than People. The best part about my job is leveraging 2+ decades of experience to help advisors provide financial security to families in their communities. Chris started with Northwestern Mutual as in intern in 2014 and began working with the Financial Planning Services team in January of 2017. As Team Lead of Financial Planning Services, Chris’s responsibilities include creating financial plans, administering investment solutions into clients’ plans and consulting with teams to ensure processes are efficient and that we are doing what is best for the client. In his free time Chris enjoys golf, spending quality time with his family, and cooking. The best financial advice I ever received is to live within your means and start saving early. The best part about my job is being able to help a lot of people every day. Jacob started with Northwestern Mutual in January 2018. He graduated from the University of Wisconsin-La Crosse with Bachelor of Science degrees in Finance and Economics. As a member of the Financial Planning Services team, Jacob is responsible for working with brokerage and advisory accounts, creating financial plans, consulting with teams, and facilitating asset movements. Outside of work Jacob enjoys fishing, playing baseball, bowling, and spending time with family and friends. The best financial advice I ever received is ‘Save a little now or save a lot later’. The best part about my job is being a part of a great team that helps people achieve their goals. 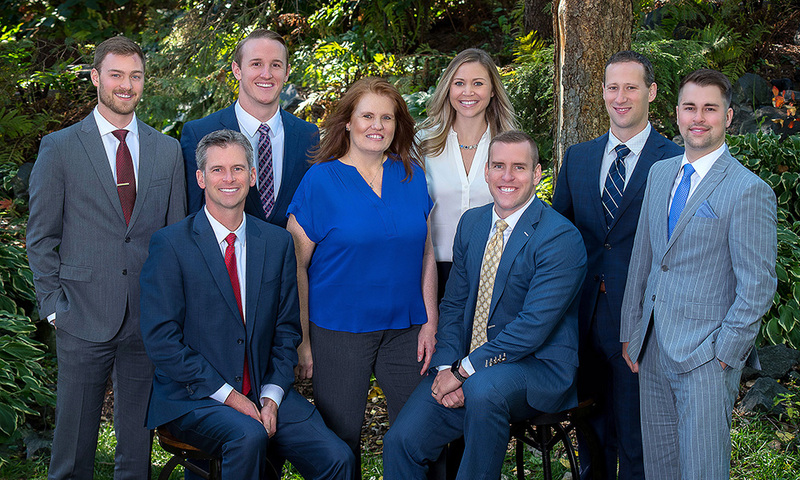 Cory started with Northwestern Mutual in Financial Planning Services in August 2018. He received a bachelor’s degree in Education with a minor in Mathematics from Bethel University. Previously, he was a math teacher in Apple Valley, MN. Cory completes the on-boarding process for brokerage accounts and builds PX plans for clients. In his spare time, Cory enjoys going on trips with his wife Lauren, sports, and coaching. He currently lives in Farmington, MN. Best financial advice ever received: Don’t spend money you don’t have and start saving early in your life. Best part of my job: Knowing that I am helping people with their short and long-term goals.